Why leadership development is crucial to good business? Leadership development has become a key strategic issue for contemporary organizations. Organizations without a properly structured leadership development processes compete in the marketplace at their own peril. The leadership field is constantly evolving with new insights and discoveries that can benefit the development of your organization’s leaders. Successful leadership is not only about the quality of training content: it's about establishing development processes and integrating leadership learning into the work environment. For more information, take a look at our brochure, or contact us to schedule an appointment with one of our representatives to see how your company can beneficiate from our leadership program. If you are interested in this course, you probably have some professional exposure to the duties of a project manager, or you may be considering embarking on a career in professional project management. Your ability as a project manager to demonstrate best practices in project management—both on the job and through professional certification—is becoming the standard to compete in today's fast-paced and highly technical workplace. In this course, you will apply the generally recognized practices of project management acknowledged by the Project Management Institute (PMI)® to successfully manage projects. For more information, take a look at our brochure, or contact us to schedule an appointment with one of our representatives to see how your company can beneficiate from our PMP training program. For a detailed presentation on this product, please click here. 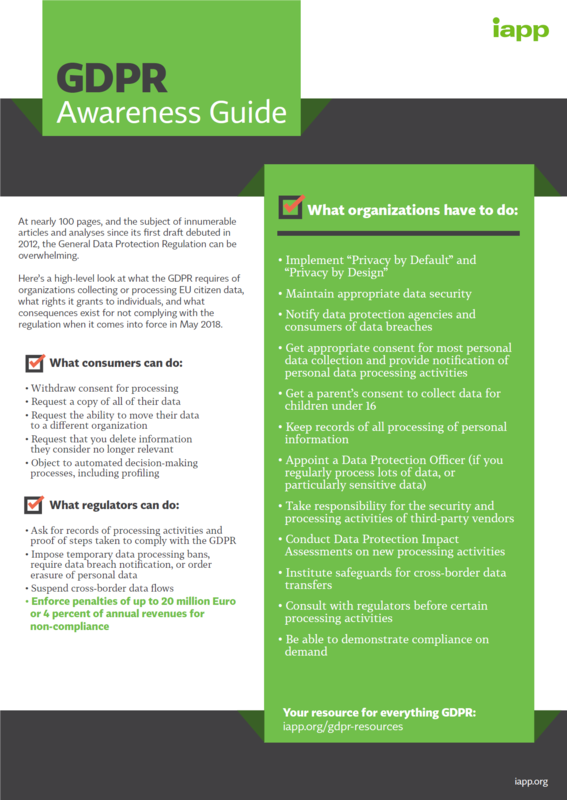 For the GDPR flyer, click here. For more information, take a look at our IAPP brochure, or contact us to schedule an appointment with one of our representatives to see how your company can beneficiate from our IAPP training program. For more information, take a look at our brochure, or contact us to schedule an appointment with one of our representatives to see how your company can beneficiate from our IT training program. This course is designed to assist students in preparing for the CertNexus CyberSec First Responder (Exam CFR-310) certification examination. What you learn and practice in this course can be a significant part of your preparation. 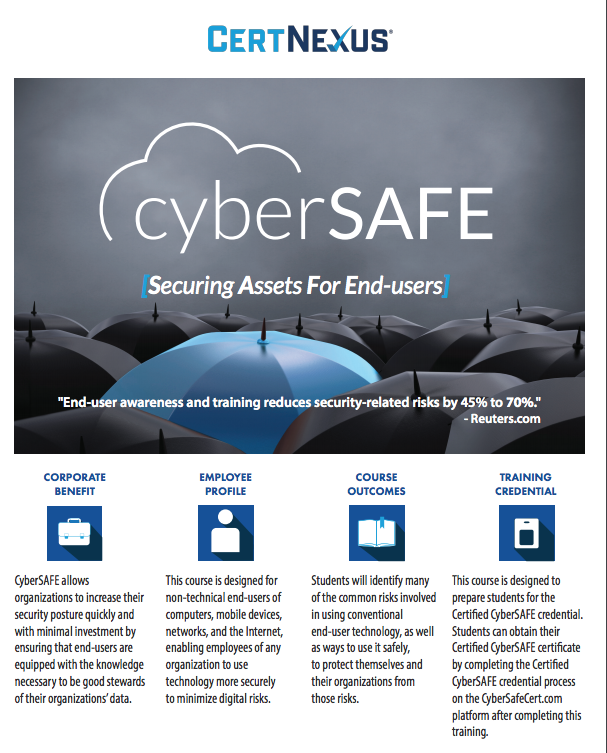 For more information, take a look at our brochure, or contact us to schedule an appointment with one of our representatives to see how your company can beneficiate from our CyberSecurity training program. Take a look at our flyer for a quick overview of the course. This class will help you become more aware of technology-related risks and what you can do to protect yourself and your organization from them. This course will help you to understand security compliance considerations, social engineering, malware, and various other data-security-related concepts. In this course, you will use discussions, case studies, and the experiences of your instructor and fellow students to explore the hazards and pitfalls of technology and learn how to use that technology safely and securely. Are YOU CyberSAFE? Contact us today to take our complimentary CyberSAFE Readiness Test. Measure your organization's level of preparedness against cyber threats with the CyberSAFE Readiness Test. Comprised of 15 questions that are designed to measure an individual’s knowledge of how to detect and avoid cyber threats, this complimentary assessment provides you with a tool to determine how well your organization is protected from imminent cyber threats.